The Packetarium XLc carrier grade blade server is designed to accommodate the highest density of hot-swappable compute power available in a 400mm deep 6U carrier-grade chassis. It is a highly scalable platform for deploying Intel® Xeon® Processor E5-2600 and Intel® Xeon® Processor D -based blades designed for the most demanding NFV workloads. The system’s 400W per RU power footprint enables deployment in industry standard 19” racks, in addition its shallow depth and straight front to rear airflow make it easy to install and operate in data centers, central offices and telecom rooms at the edge of the network alike. The system has been carefully designed to meet carrier grade requirements in these environments including NEBS level 3 compliance and five 9’s availability. These features make Packetarium XLc ideal for applications such as Mobile Edge Computing (MEC), Cloud RAN (C-RAN) and Central Office consolidation among others. 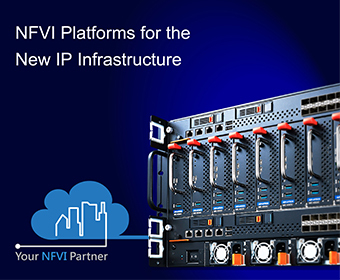 The system has been interoperability-tested with software building blocks from key Network Function Virtualization (NFV) ecosystem vendors to provide a fully-functional NFV Infrastructure (NFVI). The first model in the Packetarium XLc Carrier Grade Blade Server series, the PAC-6009, incorporates a highly versatile and modular design with 9 front slots to host 9 single or dual node Intel® Xeon® processor blades. Generic compute blades run application workloads (VNFs) while dedicated cloud control nodes provide orchestration and virtual infrastructure management functions. The system includes 2 integrated switch blades using low-latency Broadcom StrataXGS® Trident switches, each with 320Gbps data plane switching capacity enabling 40Gbps mid-plane connectivity per CPU blade(1). The switch blades also provide ten 10GbE SFP ports each for 100Gbps of external I/O connectivity and uplinks. Support for an optional timing module based on IEEE1588v2 is also available to support network synchronization using industry standard mechanisms. PAC-6009 system management is based on Advantech’s widely deployed SMM-5060 shelf & system manager and is integrated on the switch / management modules. Low level shelf management runs on a dedicated ARM processor while a Freescale QorIQ P2040 runs switch management and higher level system management functions. High availability of Shelf and System management is implemented by running the modules in an active/hot standby scheme. A low latency failover mechanism is provided by a robust, low level failover interface and using crossover Ethernet connections for more extensive state and log synchronization. A full suite of management interfaces is provided ranging from a command line interface for debugging purposes, to a Secure Shell (SSH), Simple Network Management Protocol (SNMP) and a Web interface. A System Explorer is available as a secure web server with graphical user interface (GUI) that displays status and control information such as views of the system repository, sensor data and system health. It also provides access to system configuration and supports system maintenance tasks such as upgrade management. Various payloads can be integrated into the PAC-6009 allowing the system to be configured to address a broad range of telecom and industry applications. For more details on integrating a specific configuration please contact your local sales representative.